This function will compute and draw the scale of your charts. It handle both X & X-Y charts (which wasn‘t the case in pChart 1.x). If no series is defined as abcsissa or as X axis, a virtual X axis will be created numbered with data points IDs. It is possible to tune the rendering by playing with the $Format array. To learn more about this please read the Format array guide. This function must be called before any charting functions. The X Axis margin can be set using XMargin. By default the margin on this axis are set to AUTO but you can specify an integer. You can remove the X axis but keep the vertical ticks setting RemoveXAxis to TRUE. You can skip specified number of X labels using LabelSkip. You can change the dash interval of the Y lines setting GridTicks to the width of the ticks. You can specify the grid color using SkippedAxisR,SkippedAxisG,SkippedAxisB. You can specify the alpha factor of the grid using SkippedAxisAlpha. You can specify the ticks color using SkippedTickR,SkippedTickG,SkippedTickB. You can specify the alpha factor of the ticks using SkippedTickAlpha. The inner ticks width can be set using SkippedInnerTickWidth. The outer ticks width can be set using SkippedOuterTickWidth. LABELING_ALL will write all X labels. LABELING_DIFFERENT will only write labels that are different than the previously written one.. This is a simple example using two data serie, one numeric to chart and one to use as abscissa labels. This example compute & draw the scale. Only the Axis with an ID of 0 (Temperature) will have horizontal lines because of the DrawYLines option specified in the drawScale call. This example shows how you can invert the X and Y axis. 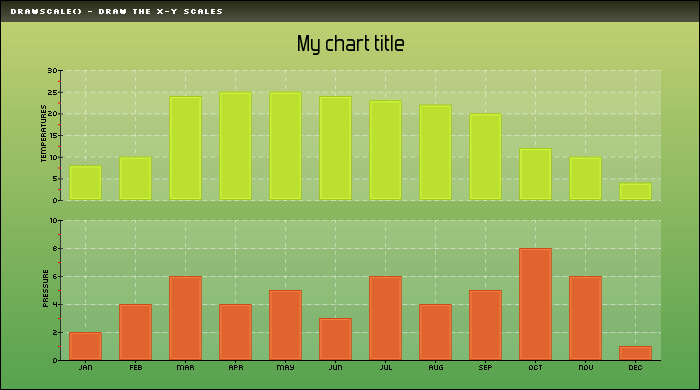 This example shows how the drawScale function handle the axis values formatting. This example shows how to play with the skipped X axis labels. This example will create a manual scale going from 0 to 100. Components used on this web site : Famfamfam icons has been made by Mark James, Rounded corners lite has been coded by Cameron Cooke and Tim Hutchison, SyntaxHighlighter has been written by Alex Gorbatchev. pChart and this web site have been created by Jean-Damien POGOLOTTI. This documentation contains 185 pages and 56 comments. 411 users have registered. This page has been rendered in 0,03 seconds. Wiki revision 1.37.